People often question whether it’s appropriate to use humor in the business world. 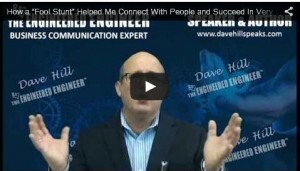 The correct response is, “Only if you want to be effective and successful.” In this video Dave Hill provides a very funny example of a potentially high anxiety business situation where lightheartedness “crept in” and turned this into a memorable interaction. When used appropriately, incorporating humor helps keep people fully engaged. Humor can help you come across as more authentic, which in turn helps people like and trust you more. Remember, if people are going to buy your message, they have to first buy you.